YAY me! It's Spring Break and it couldn't have come at a better time. I was getting stressed and tired and needed a break before I start thinking about the state testing that is coming up at the beginning of April. Today I spent the day just relaxing. I wouldn't have even gotten dressed but I had my Weight Watchers meeting this morning.... by the way 1.4 pounds down for a total of 9.6 since January. However they do say "slow and steady wins the race" so we shall see. When I got home from WW I changed right back to PJs and watched hysterical movies with my kids.....Pitch Perfect was one of them and it cracks me up every time! 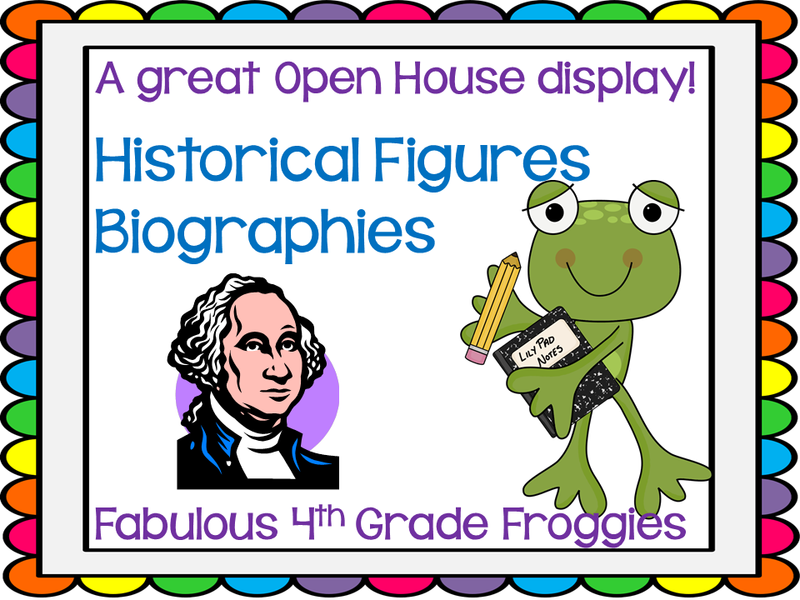 I shared this idea on my blog last year but I just had to share again because we had such a great turnout and parents loved the 4th grade hall display! This year our theme for our school's open house was "Ott Night at the Museum" (My school is named Paul W. Ott Elementary). Each grade level had different "displays" for the parents and students to took browse and view. In 4th grade we did historical figures. Here are some examples of our student's work. We gave each student the directions (download here), a "head" of the person they chose to research, and the specific paper we wanted them to use. We tied this learning opportunity to our Expository Writing standards and had the students hand write their papers instead of typing them up. This really helped with preventing the "copy & pasted from the internet type papers". The students completed the projects at home and boy were they creative! Of course we had the exceptions of the students who didn't follow any directions but for the most part everyone earned an "A" and did fantastic!!!! 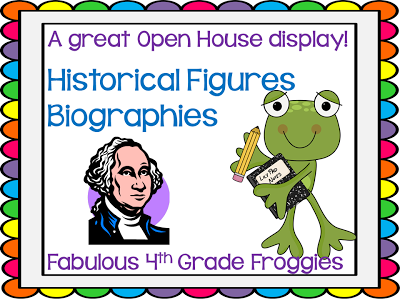 I'd love to hear some ideas of what you display for Open House! I love your projects! The kids were so creative. Congrats on you WW success. I have been fighting to get back to my goal weight. I just cracked up when I saw your post! I just did a similar post today. Loved these pictures! This is great...I've been putting off a research assignment. This will be perfect! This project looks like a lot of fun! I work with 65 gifted and talented students and I'm always looking for projects. This will definitely go into my bag of tricks! A couple of questions for you… What type of paper do you use? How long did this project take to complete? What do your students include on their planning page? Thanks so much for sharing!